I don't have a Aspen Trail but our Main TV entertainment center are similar. I am assuming that your trying to put the TV inside the recessed TV area. 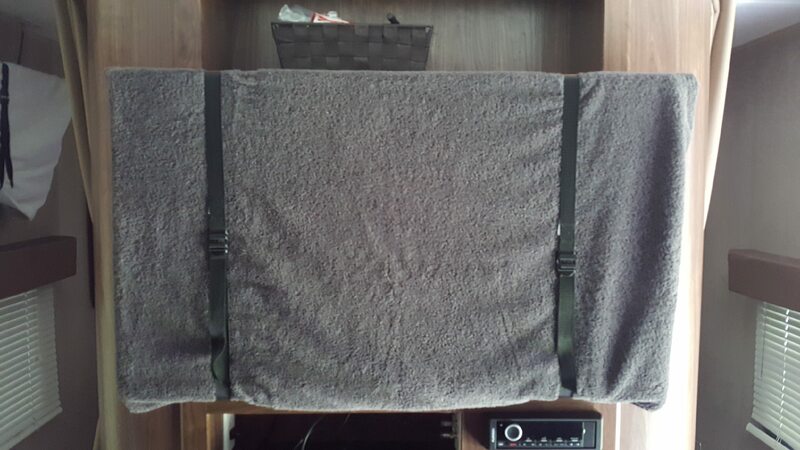 This just would not work for me, so I decided to mount the TV so it would be flush on the outside of the TV cabinet. This meant I could go from a 23" TV to a 40" TV. First you will want bring your slide in and see how much space you have between the slide and TV cabinet. You will need at least 2" of space OR the thickness of your TV with a little to spare. I used a double articulating arm TV mount. 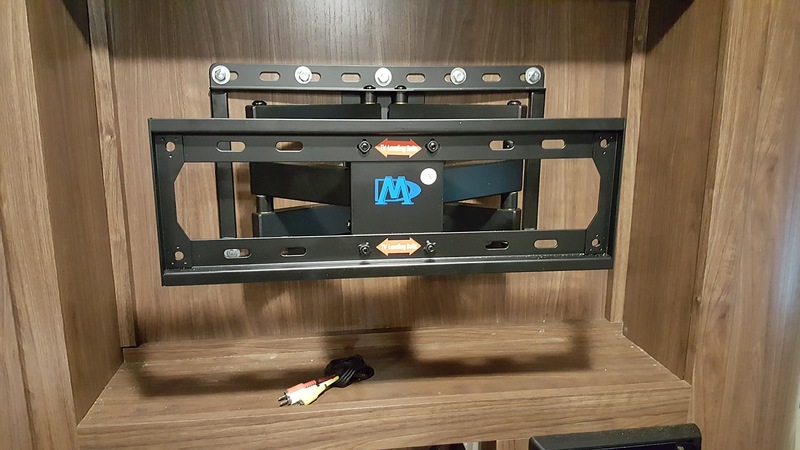 This mount will pull out and will allow the TV to sit outside of the TV cavity. 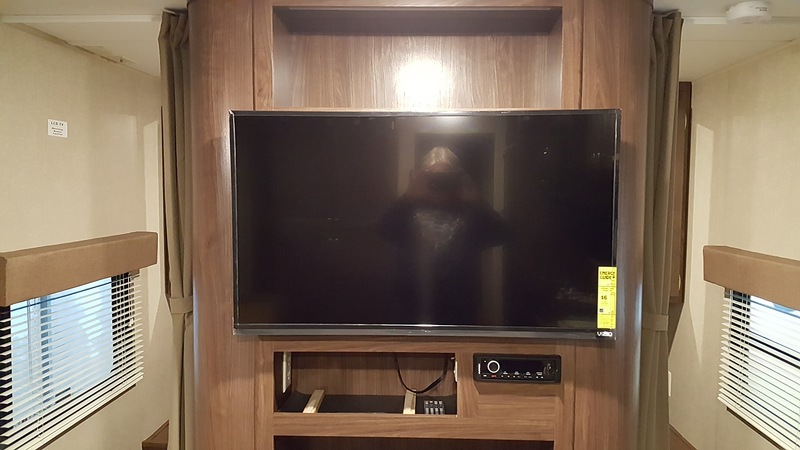 When mounted you just push the TV in til it is flush with the cabinet. I centered the mount and used 1/4" lags screw 1/2" long with washers. 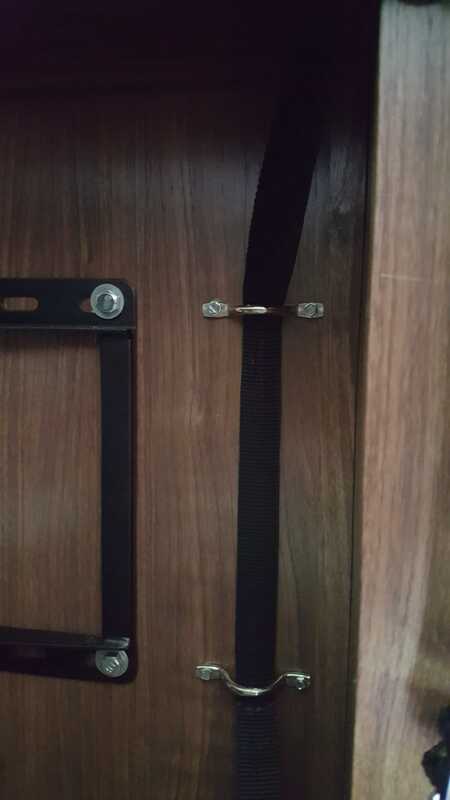 I also installed four small metal brackets with nylon straps to secure the TV in transport. As far as the bedroom goes, can we assume you have a outlet with cable connection in the bedroom? If so, use a good electric stud finder near the TV outlet and cable location. use a very small drill to test for stud or backing. DON'T DRILL TOO DEEP ESPECIALLY ON A OUTSIDE WALL. I would keep mounting screws under 3/4" long. Drill a pilot hole smaller than the mounting bolt size. Use tape or a drill dept gauge so you don't go too deep. 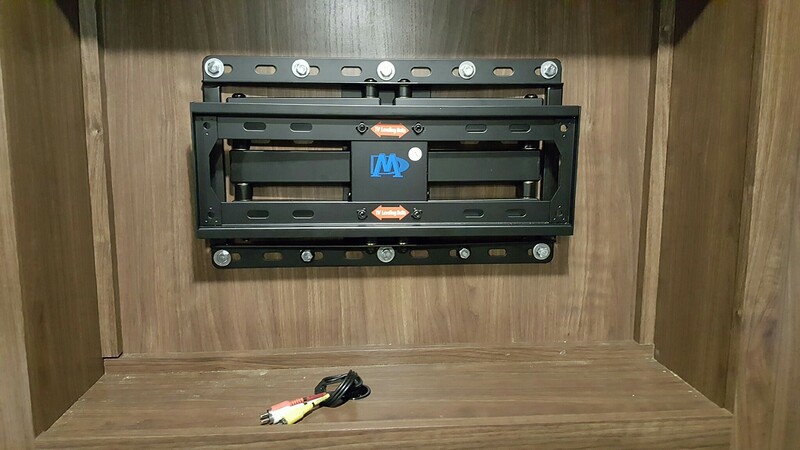 I would get a TV mount that locks in place for transport but will articulates out when you want. How long has that been up? My concern is that you are traveling down the road. BUMP BUMP BUMP. With the TV partially extended. The stresses on that mount may be significant. Just a thought. 8 lag bolts screwed into a 1/2" backing I don't think it's going anywhere but that said this is the tie down brackets I installed for transport mode. The TV does not budge. I have had this system up for about 2 years and several thousand miles now and everything is fine. Great idea with the tie downs! Always nice to have some insurance.